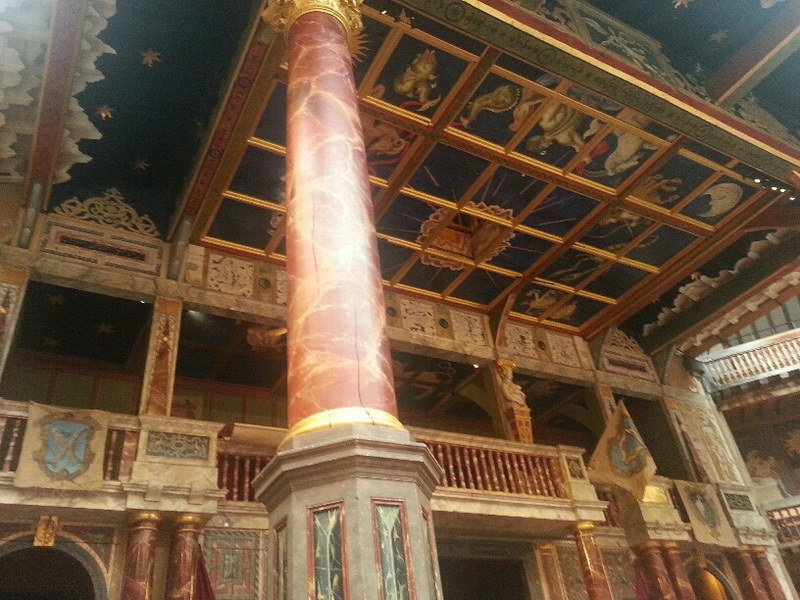 The Heavens of Shakespeare’s Globe from my groundling spot at center left of the stage. The nine o’clock start time yesterday felt so much earlier than Monday’s 9:45, and I managed to be late enough for breakfast to realize just how long that line can get. Bankside house is a curiosity when one considers the sheer variety of people in terms of age, background, purpose for travel etc., all gathered in this college meets summer camp environment. Add to that the honest to goodness bar in the basement, which turns out to be rather posh in contrast to the rest of the surroundings, and it’s almost surreal. I’m settling in rather nicely though. This morning I discovered their delicious oatmeal, which should save me from eating a full English breakfast every day. During the roughly 90 minute session, we read through the original scene and began working on the abridged version we’ll be performing. Fergal assigned us our parts ( Jaques for me) and off we went. This was followed by an unusually long but welcome midday break, after which we attended an informative lecture on Measure for Measure, which we would be attending that night. The notion of seeing Shakespeare’s plays like 16th Century peasants, or groundlings, sounds pretty romantic until you’re faced with actually standing still for about three hours. The best way to do this while maintaining what is undoubtedly the best (non) seat in the house is to get there early and make a bee-line for the stage. Not only do you get the best view of everything (for better or worse), there’s the added benefit of being able to lean on or against the stage when you stop feeling your lower extremities. Such planning, it turned out, involves the same skill set as scoping out a big screen TV on Black Friday: camping out obscenely early (around 6pm for a 7:30 show) and waiting. Our intrepid crew made it happen though and our happy little heads lined the perimeter of the stage in lieu of the nonexistent footlights. The show itself was amazing–at once spectacular, hilarious, bawdy, and every bit as morally and politically problematic as Shakespeare intended. I expected to lose feeling in my legs and feet by the time I left; I had no idea that it would be because I’d be levitating. Today’s sessions were mostly observational in nature except for a warm and spirited Q&A with two members of the incredible cast of Measure for Measure. Onward. Front and center with my fellow groundlings.